Cast of the holotype of Archaeohyrax patagonicus (MACN A52-617) in right lateral view. The specimen was collected by Carlos Ameghino from the Deseadan beds of Chubut, Argentina and was described by Florentino Ameghino. The earliest archaeohyracids are found in Vacan faunas and are notable for being among the earliest taxa in South America to exhibit hypsodont (high-crowned) cheek teeth; hypsodonty is a characteristic feature of even early archaeohyracids, and geologically younger species tended to have increasingly higher-crowned teeth. Presumably this was an adaptation for eating relatively abrasive, low-growing plants, probably in more relatively open habitats, an interpretation supported by the mesowear analysis of Croft and Weinstein (2008). Right maxilla of Archaeotypotherium pattersoni from Tinguiririca, Chile, with P2-M3 (anterior to right). The teeth are moderately worn, with the only the central fossa persisting in most of them. Like interatheriids, archaeohyracids retain a complete, closed dentition; all have a full complement of teeth with only small spaces (diastemata) separating some of the more anterior teeth. Their first pair of upper incisors are enlarged and implanted obliquely in the upper jaw (as opposed to straight up and down), and their first two pairs of lower incisors point as much forward as upward, but for the most part, none of their anterior teeth are particularly distinctive. The postcranial skeleton of archaeohyracids is unknown, though unrecognized limb bones are likely present in fossil collections from Bolivia and Chile considering the many skulls and jaws that have been collected there. Based on known skulls, many archaeohyracids were probably similar in size to a raccoon (Procyon lotor) or a red fox (Vulpes vulpes). Nevertheless, some species were much smaller, such as the diminutive Punahyrax from northwest Argentina (Reguero et al. 2008). When newly erupted, archaeohyracid display the “face” pattern of fossettes typical of other groups of typotheres. 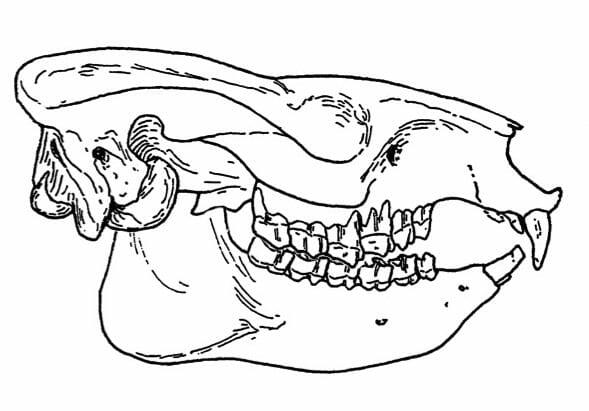 In more hypsodont taxa, the central fossa and the labial fossettes are lost with wear, with the smaller, labial fossettes generally disappearing before the larger, more persistent, central one (see teeth at left). The lower teeth resemble those of hegetotheriids but retain varying numbers of isolated fossettids that can be diagnostic of various taxa. Phylogenetic studies suggest that archaeohyracids are not a natural (i.e., monophyletic) group but rather represent a collection of taxa related to hegetotheriids and perhaps mesotheriids (Croft et al. 2003; Billet 2011). Archaeohyracids and hegetotheriids share several derived character states of the skull including a vertical septum in the auditory bulla and a more anterior placement of the carotid foramen (medial to the auditory bulla). In Deseadan faunas such as Salla (see below) where archaeohyracids and hegetotheriids co-occur, highly worn archaeohyracid teeth can be difficult to distinguish from those of early hegetotheres (see below). As is the case for many groups of notoungulates, the discovery of skulls of early members of this group would likely help clarify their evolutionary relationships. Archaeohyrax suniensis upper teeth from Salla, Bolivia in occlusal view, anterior to right. The upper specimen illustrates relatively unworn teeth from a young individual, whereas the lower specimen shows highly worn teeth from an older individual. Both specimens are from collections at the University of Florida, and the lower specimen has been flipped virtually to match the upper. (For detailed descriptions, see Billet et al. 2009). Interest in archaeohyracids has increased in recent decades due to the discovery of the Tinguiririca Fauna of central Chile and active collecting in the Salla Beds of Bolivia. In both of these faunas, archaeohyracids are quite common. Six species of archaeohyracids have been recorded from the Tinguiririca Fauna, the greatest diversity known from a single locality. Archaeohyracids are also quite abundant at this site, and two skulls of Archaeotypotherium tinguiriricaense have been identified. Clearly the early Oligocene was the “Age of Archaeohyracids” (Croft et al. 2008). The diversity and abundance of Tinguirirican archaeohyracids – all of which are very hypsodont – provide strong evidence that the mammals of Tinguiririca were living in an open woodland or grassland-like habitat. Archaeohyracid species from Tinguiririca also have been recorded at other sites in central Chile and Argentina and have been used to infer the ages of these sites in the absence of radiometric dates. At Salla, Bolivia, Archaeohyrax suniensis is one of the most abundant mammals in the fauna; as a result, is has been possible to document wear-related changes in tooth structure in detail (see example above). The cheek teeth of this species are extremely hypsodont and only formed roots in old individuals. In later stages of wear, they resembled those of hegetotheres in their simplicity, lacking of any vestiges of enamel folds or fossettes. A. suniensis is the latest-occurring member of the group; no archaeohyracids have yet been identified at Neogene localities. Billet, G., B. Patterson, and C. de Muizon. 2009. Craniodental anatomy of late Oligocene archaeohyracids (Notoungulata, Mammalia) from Bolivia and Argentina and new phylogenetic hypotheses. Zoological Journal of the Linnean Society 155:458-509. Croft, D.A. and D. Weinstein. 2008. The first application of the mesowear method to endemic South American ungulates (Notoungulata). Palaeogeography, Palaeoclimatology, Palaeoecology 269:103-114. Croft, D.A., J.J. Flynn, and A.R. Wyss. 2008. The Tinguiririca Fauna of Chile and the early stages of “modernization” of South American mammal faunas. Arquivos do Museu Nacional, Rio de Janeiro 66:191-211. Croft, D.A., M. Bond, J.J. Flynn, M.A. Reguero, and A.R. Wyss. 2003. Large archaeohyracids (Typotheria, Notoungulata) from central Chile and Patagonia including a revision of Archaeotypotherium. Fieldiana: Geology (New Series) 49:1-38. Reguero, M.A., D.A. Croft, G.M. López, and R.N. Alonso. 2008. Eocene archaeohyracids (Mammalia: Notoungulata: Hegetotheria) from the Puna, northwest Argentina. Journal of South American Earth Sciences 26:225-233.